Michael Kenneth Williams, an actor known for playing a cop cuckolded by a midget in Trapped In The Closet and probably an HBO show or something, has landed the lead role in The Spoils Before Dying, IFC’s follow-up to The Spoils Of Babylon. Williams, who was also recently seen alongside Mark Wahlberg in The Gambler and Joaquin Phoenix in Inherent Vice, will star as Rock Banyon, a jazz pianist in 1950’s Los Angeles forced to clear his name after his lead singer and on-again, off-again flame is found murdered. This role will give Williams, frequently cast as a heavy, the chance to play the pursued and not the pursuer for once, as well as make those silly faces people always make when they’re playing jazz on TV. Will Ferrell is also set to return as drunken author Jonrosh, upon whose booze-soaked musings the fictional adaptation is ostensibly based. The IFC role isn’t the only gig Williams recently added to his iCal, however. 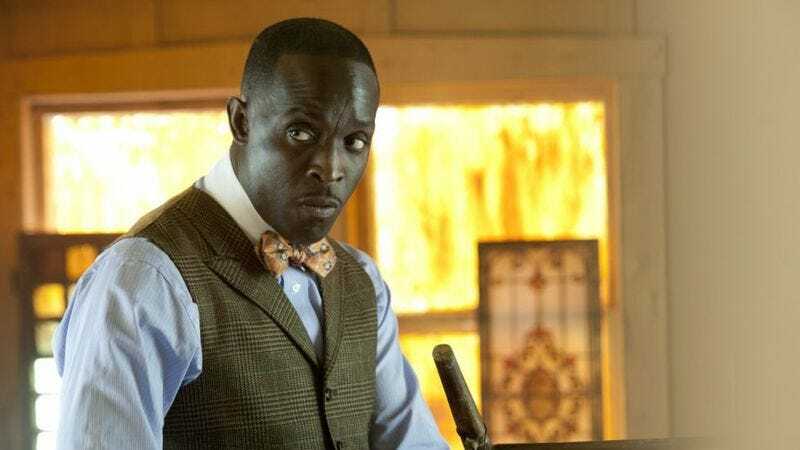 Deadline reports that he has also been cast in a lead role in Sundance’s new drama series Hap And Leonard. In this particular six-episode series, Williams will play Leonard Pine, an openly gay Vietnam War veteran; when Leonard’s uncle kicks him out of the house, he is forced to turn to Hap, a working-class white man who spent time in jail for refusing the draft, for support. We feel like this isn’t Williams’ first time playing an openly gay character, either, although we’re having trouble placing it. Oh well.